The Beta is kind of a mess right now. This must be one of the buggiest beta patches, because a lot of critical quests - quests that block advancement - are broken, some mechanics are broken as well, and.. well, it's hard to keep record of anything because it's impossible to see an entire zone, and in some cases, you can't even get to see any of it. But that's what beta tests are for, right? I'm very grateful I got a beta key and I try my best to report bugs and suggestions every day. With that in mind, I'll keep posting my impressions so far, but unless we get a new (and more stable) patch things will be kind of incomplete. Also, I was playing on a server that doesn't shows up on my list anymore, so I lost all my characters. Time to start anew, I guess! Time for some Shen'dralar goodness. A little lore background: You can now roll Night Elves Mages because the Shen'dralar came back to the night elves and wanted to join them again for the sake of surviving against the forces that threaten Azeroth in cataclysm. So basically if you roll a night elf mage it's either a Shen'dralar or a young night elf that is being taught arcane magic by them. 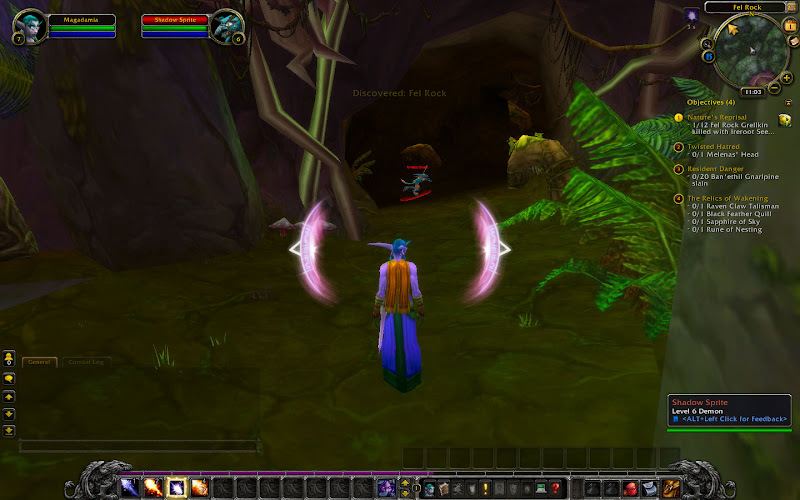 The night elf starting zone is almost the same as before. The quest haven't changed much regarding what you have to do, but they have changed a lot regarding WHY you are doing what you do. The story is much better now, it's very well told and everything has a purpose. Some things have changed, to make some quests easier. 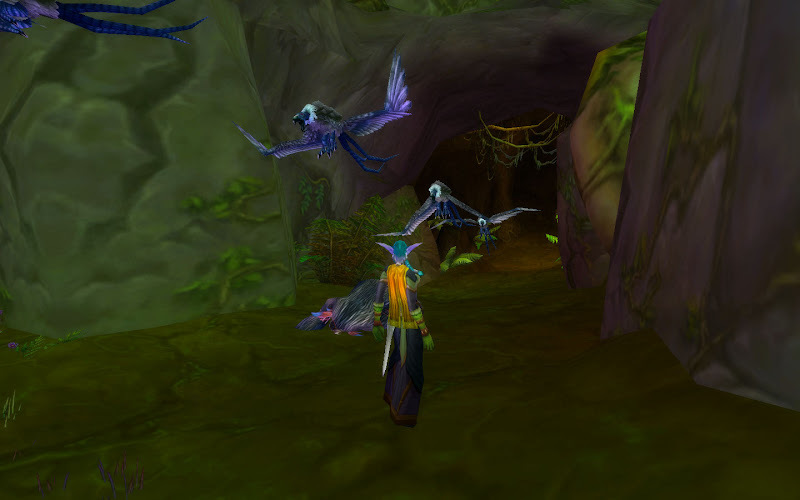 Everyone that has leveled up a nelf remembers the quests inside the Imps cavern, or the quests in the barrow dens. Those were some really annoying quests, but now the devs changed them and they don't seem much of a hassle, and are in fact fun now. 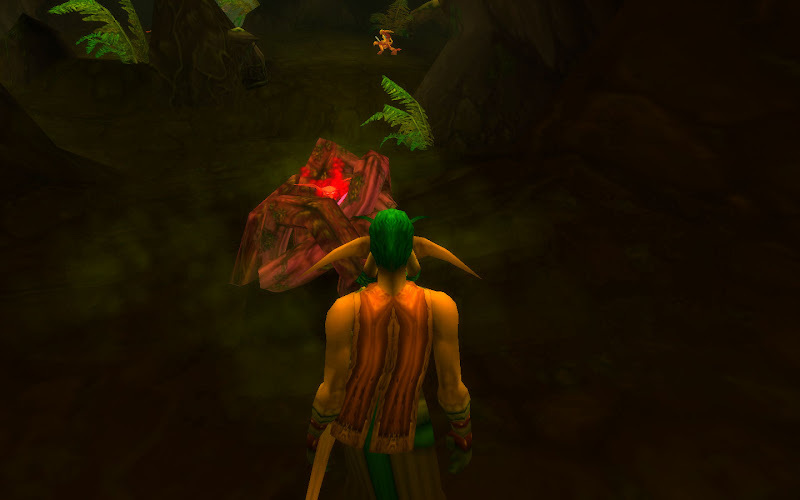 For this quest, now you get an item that roots and kills the imps, so you are free to explore the cave and complete the other quests without worrying for respawns on these annoying fucks. One of the biggest surprises was the change to the Barrow Dens quest. This was one of the most annnoying quests because that place is a mess and the mobs were kind of unforgiving. 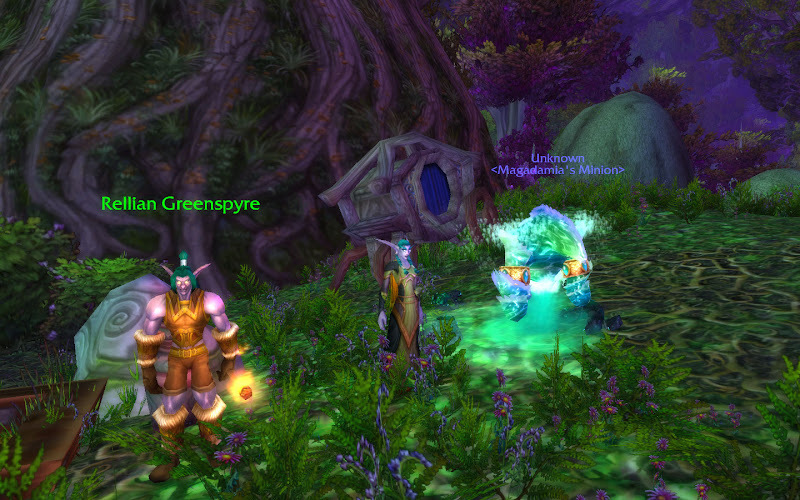 Now, after I entered the dens, a night elf sentinel came to my aid! but the best part is, you could ask her for directions to the 4 quest items you need from here, and she would create a green mist that would flow in the direction of the item! that right there improved this place by 1000%. 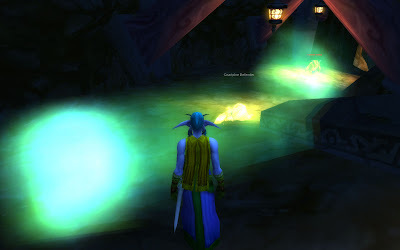 They could have made the sentinel not attack the mobs with you and this quest would have been vastly improved by the green mist. I really hope they implement this new tech in some other confusing quests and dungeons. I can see this working in The Wailing Caverns, one of the most confusing dungeons in the game. I also found a whole new line of quests in teldrassil, along with a new area. This quest takes you to a path up the mountains inside of teldrassil to free some druids of the talon controlled by a furlborg. It was nice to see new things added to this zone. Finally, the zone seems to end in an EPIC quest where you combat the remaining corruption on teldrassil (which is an army of demons and satyrs) by being infused with power by Elune herself. Your actionbar changes to different abilities that sound totally epic. Alas, this quest is bugged, so I can't really say how it ends, or how it goes, or take screenshots. From the looks of it and the buildup, it seemed to do justice to the zone. I glossed over this zone but as with the human zone the experience here has been vastly improved. This zone used to be very dull and pointless, but now it's very interesting and not annoying at all. The new flight points in the zone cut down the walking you have to do, and overall it's very well tuned. 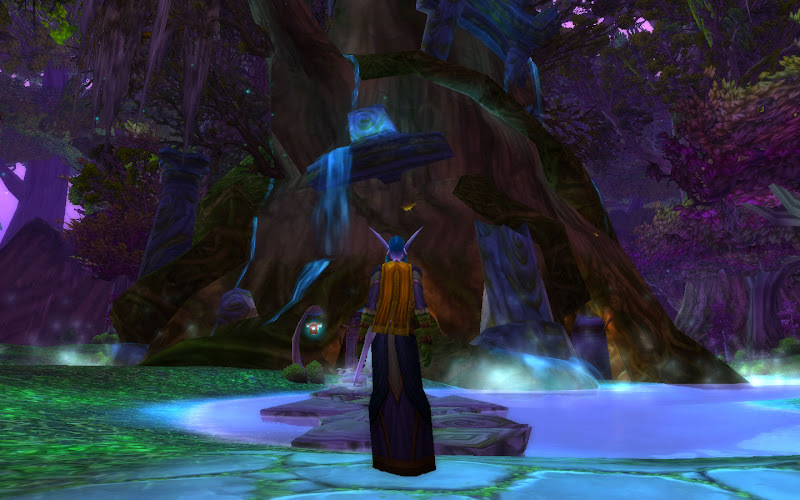 I can see myself leveling up my night elves in this zone again. By the way, I visited Darnassus, and with the changes to some of the architecture and the new graphic improvements it looks prettier than ever. Also, there's a new zone, the Howling tree, and it seems to be where the worgen will hang around. It's very beautiful. I will leave you with a slideshow of some of the pictures I took. Enjoy! As the 90% of beta testers, I created and leveled up a Worgen when I got in the beta. It's the first thing most people do, besides checking out the post 80 content. I will probably not talk about it much because the information about the worgen quests are avaliable everywhere. After the obligatory worgen roll, I rolled a human hunter, and that's what I'm going to talk about today. Compared to the other revamped zones, the human starting zones (Northshire Abbey/Elwynn Forest) haven't seen nearly as much changes. Anyways, as I rolled my hunter I got dropped in the same place you start right now on live, except there's a new recruiting booth nearby. Once you get your first quest, you see King Varian aproaching. Yes, now humans get recruited by King Varian himself! Anyways the quests are mostly intact. Kill wolves, go for the troggs, "YOU TAKE NO CANDLE", etc. The only change is that there are no more Defias around. The Defias are completely gone (Or at least they make you think that! ), and instead you get the Orcs from the burning steppes that are attacking the Abbey. They burned down the grape farm, btw. After you get out of Northshire you are sent to Goldshire just like in Live. Again, the quests are the same but they have been somewhat reorganized so you don't have to walk as much as before. But you have the same quests in the Saldean farm, and well you get the point, it's mostly the same but better streamlined. Something they changed though was adding Flight points in both Goldshire and Eastvale logging camp. This makes the questing in this area MUCH better. I remember hating that dreaded walk from Goldshire to Eastvale. I didn't find new quests in the logging camp though, it's again mostly the same as in live, only not as annoying. All of the annoying quests were removed as well, so that's a plus. As far as I've seen, all the zones now have a theme that leads into a couple of final quests that are the climax of the zone. Elwynn doesn't have a real theme, you run around helping people and handling the trogg, gnoll and murloc problems. There's a final quest though, and it was kind of epic, and surprising! Everyone remembers Hogger. It's one of those WoW memes that everyone inside of the game knows, and even people outside of the game know as well. Well, Blizzard saw the chance to capitalize on this and they gave Hogger his own hill in the gnoll camp. When you engage him, the fight seems like normal, but this time around, he calls minions when he's low on health, and also runs off to his hill and eats the carcasses to regain his health! Badass. After I dealt with him, to my surprise, General Marcus - warden of the stockades, appears along with 2 mages, and takes him as a prisoner to the stockades! what's even more fun is when you turn the completed quest to Marshal Duggan and he complains about the implications of having a powerful gnoll in a jail with a lot of other gnolls. Overall, don't expect a whole new experience for the humans and their starting zone, Elwynn Forest. although it changes dramatically once you get to Westfall, the experience in Elwynn is mostly unchanged. However, it is much easier to level up here now, and the experience is less of a hassle and definitely more fun.